Spelling Rules Directory - This colourful, illustrated spelling aid will teach children the tips and tricks that make spelling easier. The Spelling Rules Directory introduces spelling conventions and guidelines that generalise across many words. Rules are divided into positioning, suffixes and spelling guidelines. 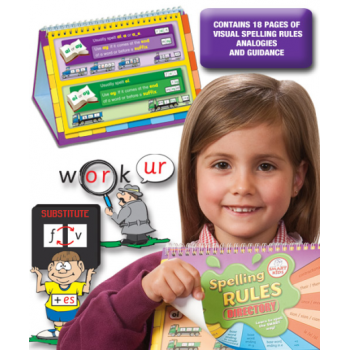 With handy pictorial aids and diagrams, as well as concise explanations this desk-top aid will be useful for all students struggling to grasp our eccentric English language spelling rules, helping them to become confident spellers.